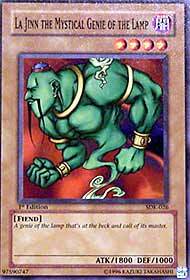 SomeGuy La Jinn the Mystical Genie of the Lamp, IMO the second best Monster in the set (First being Summoned Skull). He is truly amazing for a level four, and takes out both Battle Ox, Neo the Magic Swordsman (two monsters of choice for many experienced players), and many others. As of now he has the highest attack power without a tribute (1800). He, like his other speedy friends, has the 1000 defense which is really not a big drawback. Like the others he will most likely be attacking your opponents life points and thus not being in defense mode. From what I hear, there will possibly be another card just like him in Metal Raiders. CCGChewie La Jinn! YaY! The single best lvl 4 offensive attacker in the game! With an amazing 1800 attack he’s got the best attack power for a non-tribute monster. Not only that he’s a dark giving him access to a Sword of Dark Destruction. PLUS, being a Fiend gets him the standard Equip, in his case Dark Energy, AND the Field, Yami. Simply put, this guy goes into ANY deck.